Earlier this year at CES, we showcased consumer products powered by Android Things from partners like Lenovo, LG, JBL, iHome, and Sony. We are excited to see Android Things enable the wider developer ecosystem as well. Today we are announcing the final preview release of Android Things, Developer Preview 8, before the upcoming stable release. Developer Preview 8 represents the final API surface exposed in the Android Things support library for the upcoming stable release. There will be no more breaking API changes before the stable v1.0 release of the SDK. For details on all the API changes included in DP8, see the release notes. Refer to the updated SDK reference to review the classes and methods in the final SDK. Enhanced OTA: Unpublish the current OTA build when issues are discovered in the field. Visual storage layout: Configure the device storage allocated to apps and data for each build, and get an overview of how much storage your apps require. Font/locale controls: Configure the set of supported fonts and locales packaged into each build. Group sharing: Product sharing has been extended to include support for Google Groups. The new app library enables you to manage APKs more easily without the need to package them together in a separate zipped bundle. Track individual versions, review permissions, and share your apps with other console users. See the app library documentation for more details. On mobile devices, apps request permissions at runtime and the end user grants them. 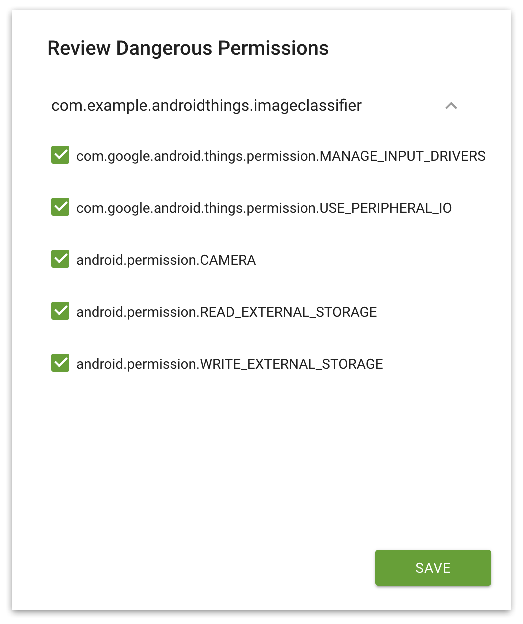 In earlier previews, Android Things granted these same permissions automatically to apps on device boot. Beginning in DP8, these permissions are granted using a new interface in the developer console, giving developers more control of the permissions used by the apps on their device. Embedded devices need to launch their primary application automatically after the device boots, and relaunch it if the app terminates unexpectedly. In earlier previews, the main app on the device could listen for a custom IOT_LAUNCHER intent to enable this behavior. Beginning in DP8, this category is replaced by the standard CATEGORY_HOME intent. Apps that contain an IOT_LAUNCHER intent filter will no longer be triggered on boot. Update your apps to use CATEGORY_HOME instead. Thanks to all of you in the developer community for sharing your feedback with us throughout developer preview. Join Google's IoT Developers Community on Google+ to let us know what you're building with Android Things and how we can improve the platform in future releases to help you build connected devices at scale!